Right at the top is a gif from IBMblr, a tumblr celebrating the ingenuity of global tech giant and longstanding commissioner of great design, IBM. Conceived by Irish art director Susan Murphy at Ogilvy & Mather, IBMblr is a super clever use of some of the most enjoyable and accessible bits of the internet - gifs and Tumblr - and received over 7 million views in its first 30 days. It also included the World's Smallest Movie. Directly above is the identity for Dublin Writers' Festival 2011, one of my favourite recent identities. Aad created this along with a range of materials for the festival, playing on glyphs, type and lettering in such a way as to express the wide range of writing and writers the festival was celebrating. 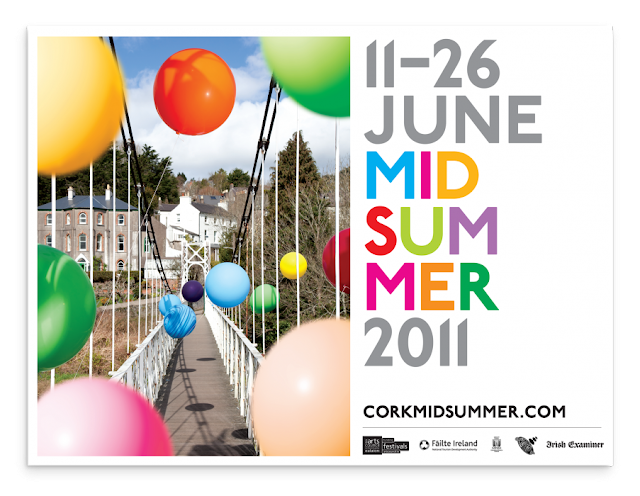 Also by Aad and also from 2011, below is an example of the materials created for Cork Midsummer Festival. Featuring places in Cork filled with big bright balloons (photographed by Rich Gilligan), the work has exactly the energy and colour you would hope of a summer festival of culture. 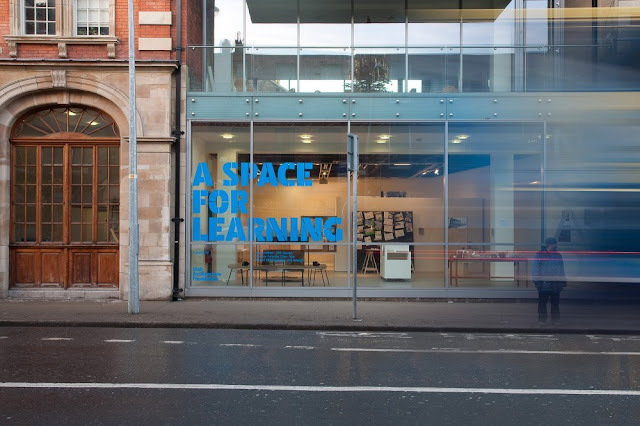 Proving that 2011 wasn't the only good year for graphic design, above is the identity created by Unthink in 2010 for the Irish Architecture Foundation's A Space for Learning project. Full disclosure: A Space for Learning is the first major project I worked on when I was at the IAF, but I'm sure looking through Unthink's work for this, you wont accuse me of any bias... They played with the idea of architecture by creating a boxy 3d version of the typeface usually used by the IAF and applied it to exhibition materials, a publication and online resources, marrying an existing identity with a new project in an inventive way. Also balancing consistency with variety is the work by Zero G for the Abbey Theatre, an example of which is pictured below. 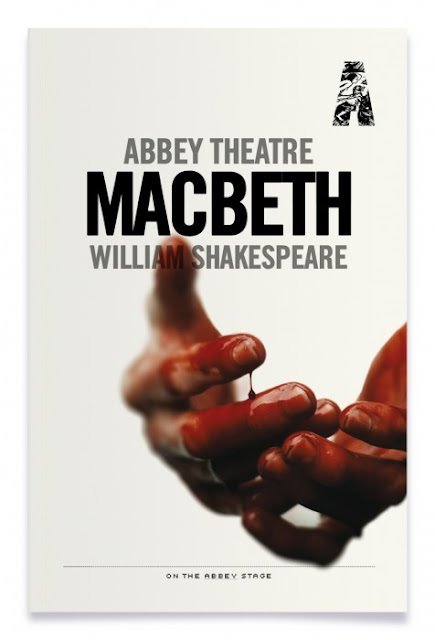 They've created a bold identity for Ireland's national theatre which is applied to materials for every play the theatre puts on, yet they find a way to bring through the essence of each performance through photography, illustration and more. Always recognisable, yet always fresh, it's really impressive design. For me, looking through this first introduction to the 100 Archive prompted me to think about a few things. It was a great reminder of some of the excellent graphic design that I have enjoyed in recent years. It was also surprising: while a lot of the work was familiar to me, much more of it was new, making the 100 Archive an exciting source of discovery as well as a reunion with old friends. While the 100 Archive celebrates design and those who make it, the initiative has brought it home to me that it's not just designers who are responsible for design. Clients and commissioners ensure that work gets made, and without forward-looking, adventurous and generous clients, Irish graphic design won't continue to grow as it has in recent years. They need to be celebrated as much as the designers: they're the ones taking risks, creating opportunities and investing in Irish design for the long term.